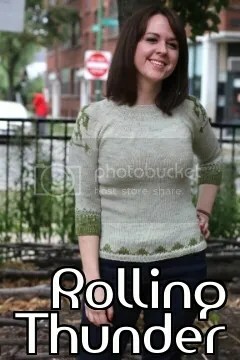 I love providing new masi|knits yarns for the Holla Knits collections. And this season is no exception. There are so many awesome patterns, I can’t decide which one to cast on first. But Rolling Thunder is one of my absolute favorites. I love how the colorwork fits so well with our new Nantucket colorways. Detail of Rolling Thunder colorwork in masi|knits Nantucket colors – seaglass and ivy. The overall construction and shape is also totally up my alley. Rolling Thunder in full view. Want a chance to win this pattern? Head over to Holla Knits for your chance! (Doh! the hazards of late night blogging…) Comment below for a chance to win the Rolling Thunder pattern (I will pick a winner in one week). And head over to Holla Knits for a chance to win a free skein of masi|knits Nantucket in Seaglass. I would love a copy of the pattern. Thanks! This pattern is so adorable!! It would be perfect for the mild winters in California.